Thanks to the hard working members of Immanuel Lutheran, E. Peoria and to all our new friends from the community theater community who brought this history based and “odd” script, Martin Luther, A Beggar Before God, The Musical, to life. You gave amazing performances show after show. Thanks as well to the nearly 300 patrons who came to see it. Thank you for spreading the word and your kind and enthusiastic comments. Will we do it again next year? A little too early to answer that question, but your thoughts are always welcome. October 31, 1517, Dr. Martin Luther nailed his famous 95 Theses to the door of the All Saints’ Church in Wittenberg. His intention was to call in to question the sale of indulgences and try to move the Catholic Church and the Pope back towards biblically sound teachings. What he did instead was spark the Lutheran Reformation, which has had a lasting impact on western civilization and the world. 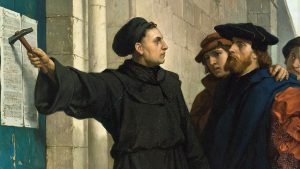 You may not know it, but we are all heirs of the Reformation.